William J. 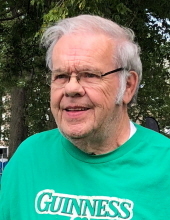 “Bill” McBride, 79, of Waterloo, died Sunday, November 25, 2018 at Friendship Village Pavilion. He was born March 31 1939 in Waterloo, son of William J. and Helen R. Joyce McBride. He married Mary Linda Smith Aug. 18, 1962 at St. Joseph Catholic Church, Waterloo. Bill graduated from Our Lady of Victory Academy Class of 1957, Waterloo and Loras College, Dubuque. He retired from Deere and Company as a supervisor at the Engine Works January 31, 2000. Survived by: his wife; a daughter, Marcie (David) Cook of Rocky Mount, N.C.; a son, Shawn (Lisa) of Waterloo; 6 grandchildren, Joseph, Kelley, Nathan, Brandon, Molly and Jaxon. Preceded in death by: two sons, Kevin and Mark McBride. Services will be 11:00 a.m. Wednesday, Nov. 28 at Blessed Sacrament Catholic Church with burial in Mt. Olivet Cemetery. Public visitation will be from 4 until 7 p.m. Tuesday at Hagarty-Waychoff-Grarup Funeral Service on West Ridgeway where there will be a 6 p.m. vigil. Public visitation will continue for one hour before services at the church on Wednesday. Memorials: Cedar Valley Hospice or the church. To send flowers or a remembrance gift to the family of William J. McBride, please visit our Tribute Store. "Email Address" would like to share the life celebration of William J. McBride. Click on the "link" to go to share a favorite memory or leave a condolence message for the family.